OSU coach Mike Gundy says offensive coordinator Mike Yurcich is a rising star in his profession. 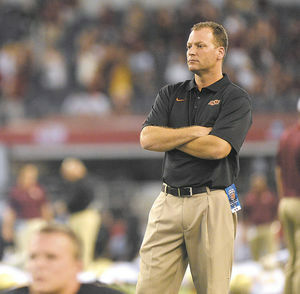 Oklahoma State coach Mike Gundy said offensive coordinator Mike Yurcich is the best play-caller he has ever worked with after Saturday’s game at Iowa State. The Cowboys are averaging 43.6 points a game, which ranks seventh in the nation. OSU also ranks 18th in total offense, averaging 497.6 yards a game.